Very 'your local shopping center meets Chevron in Surfers, meets Downtown Disney'. A few questions this whole thing brings up: Dreamworld anchor tennant. Dreamworld is a tennant? That seems odd to me. When does major construction start? How big? & where does this leave the Big Brother house and contract? Are the previously mentioned tourism amenities (hotels etc.) part of Stage one (or still on the cards at all)? Look forward to seeing this all come together. Hopefully we'll get an idea of the scale of this part of the project soon. Citywalk is more or less a separate entity from Dreamworld. It's really a combination of a shopping centre, with touches of Downtown Disney or Universal CityWalk thrown in. It's not an expansion on the theme park like these were, but rather a complimentary fixture. The first stage of Citywalk is supermarkets, a department store and specialty shops. It was mentioned that residential precincts would come later, which may include hotels. It's worthwhile to note that in the Subscription section, there are further concept images available than those posted. Sorry but, what i meant to say is that a full scale shopping centre next to theme parks don't look attractive. Correct me if i'm wrong, but from the artwork in the post above it looks as though they aren't going to have a multistory carpark, so it'll take up alot of land. It won't be aestheticly pleasing, and it will also restrict any possible expansion of Dreamworld. Im not very knowledegable about the geography of dW. Where exactly would the citywalk come in to dreamworld. Also, will it be built on DW land? http://www.parkz.com.au/forums/attachmentid=1023 Off to the left. DW owns the land, but its excess land thats not being used. Do you think if they used the marketplace as a temp entrance, they could develope the front carpark (coaches and dropoff) into a new themed area?? If citywalk had a multideck as its parking (which it probably will) That could replace DWs current carpark, which could then be developed. Quote :This development will represent the first entertainment destincation in Australia that delivers a unique blend of theme park fun and world class shopping adventure fully integrated into a themed retail environment," If this were true, then how do you explain Entertainment Quarter aka Bent Street @ Fox Studios - when they still had the Backlot?? Being someone who lives within 10km of Dreamworld and having links to the management, as well as regually reading the Gold Coast Bulliten where the article on this was first placed, I have answers to a lot of questions. Dreamworld owns the land from Beattie Road, up to Foxwell Road. at the moment they have only developed one half of their land. 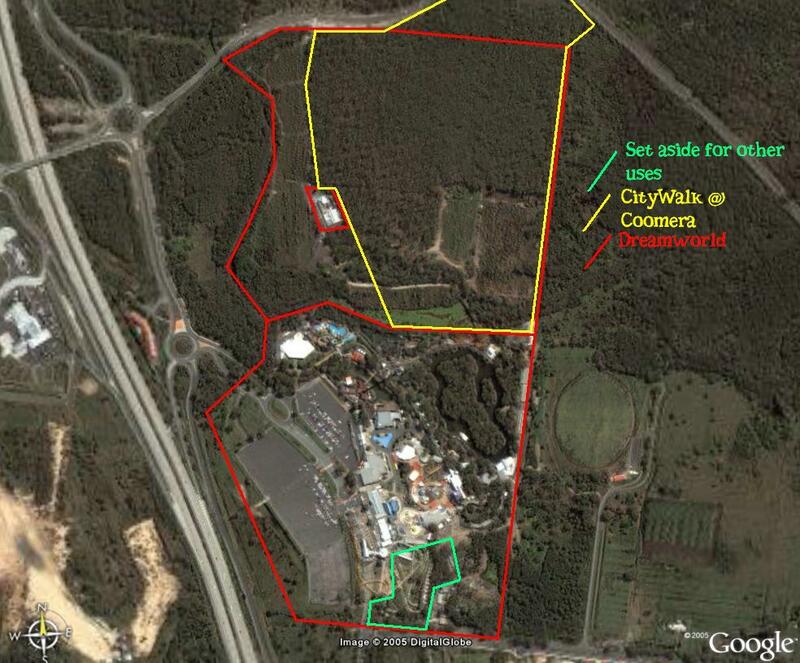 I have a map attached showing the land of Dreamworld and where I believe CityWalk at Coomera will be. The part of CityWalk not owned by Macquarie Leisure Group is owned by Coomera Town Centre Managment and will be bought by Dreamworld. This still allows space for BigBrother as well as more rides. We all can kinda guess whats going in the area were the ThunderBolt was... Hmmm maybe a new WATERPARK? Is it really necessary for a big shopping centre there? Just up the road a new Westfield shopping centre is being built at Helensvale near the railway station there so I really don't think the population of the region (even though it is growing quickly) can sustain something on too large of a scale. "Just up the road" happens to be a 10km drive. Count how many major shopping centres there are within a 10km drive of your home - I count 6 and that's leaving out the CBD. I live here. I know the problems. Coomera needs a major shopping centre. Westfeild is too far away, especially to residents of Ormeau and Pimpama and it wont have a cinema or other such facilities. The real question is what shops would it have? There is already a Coles under construction at Upper Coomera, near Saint Stephens College and Upper Coomera State College and at Westfeild; a Bi-Lo at Upper Coomera; Woolworths at Oxenford and Westfeild... 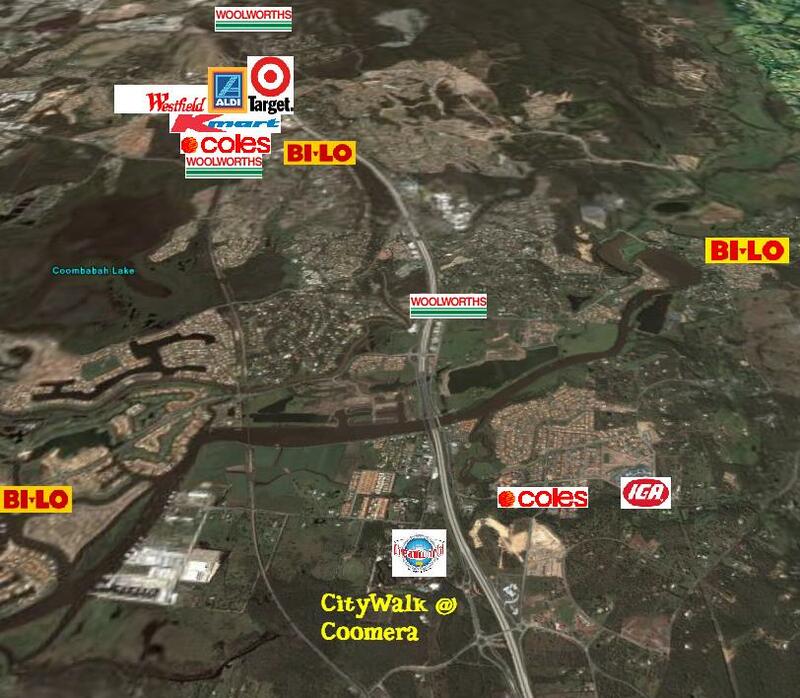 So most companies have already set up in the area (see attached map) But if you look at the map there are heaps of shopping centres from Coomera to Pacific Pines, but on the other hand there are 2 between Coomera and Beenleigh. So it is needed up north, but why didn't they build it up there? The train station and the other infrastructure it was in a prime position. Thats why they are building it there. Before I moved to Brisbane, I would have had to travel half an hour to get to the nearest shopping centre so I really don't see the problem in travelling 10km to go to a shopping centre. And I don't see how you can really compare that to Brisbane, since the difference in population density between Coomera and Brisbane City. Screw the city walk! Use the land for other things.. like MORE RIDES...maybe even a massive Woodie that goes through the bush or something... or something like a Horse Range or Paint-Ball...! Paintball is done, its down near MovieWorld Wooden rollercoasters are stupid Dreamworld has plenty of land and if they build this shopping centre, they get more profit = more and better rides. Eventually the old rides will be replaced by new ones, rollercoasters will be built over the shopping centre, there will be a monorail to the train station and the island in the middle of the Murrusippi River will become a massive themed area. And thats without using the excess land shown on my original map. And I don't see how you can really compare that to Brisbane, since the difference in population density between Coomera and Brisbane City. Well that would be why I can get to six shopping centres in a matter of minutes from here, whereas in the region in question there will only be a select few. It also doesn't hurt to add that one of the key reasons outlined for this development was the tremendous population growth the area is experiencing. It doesnt really matter if all the major chains are in the area. I know of A Safeway which is in line of sight down the road from another one, and its not far either, like only a block away. So i dont really think it will be a problem. And anyway, is there a Pick'n'Pay or a Big W in the area? 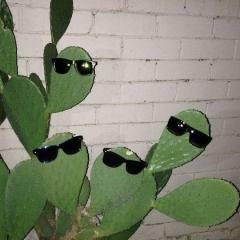 Or what about a Myer. Plus they can always build plenty of specialty shops, and I imagine a fast food restaurant would do well there. people could grab some brekky from one in the morning after getting off the train, and then get tea after the park closes. But just a question, Is Coomera on the left side or the right side of the freeway in the supermarket photo?